The Rolling Stones will release “Crossfire Hurricane” on DVD, Blu-ray and digital download on May 21. The project is the kaleidoscopic new film that documents the key periods of the Rolling Stones’ career and their incredible journey. 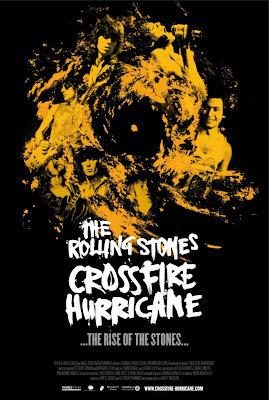 Directed by Brett Morgen, “Crossfire Hurricane” provides a new perspective on the Stones’ unparalleled journey from blues-obsessed teenagers in the early 60’s to rock royalty. It’s all here in panoramic candor, from the Marquee Club to Hyde Park, from Altamont to Exile, from club gigs to stadium extravaganzas. With never-before-seen footage and fresh insights from the band themselves, the film will delight, shock and amaze longtime devotees, as well as a new generation of fans, with its uniquely immersive style and tone. "Crossfire Hurricane" places the viewer right on the frontline of the band’s most legendary escapades. Bonus features on the DVD and Blu-Ray include previously unreleased concert footage - “Live in Germany ‘65”, NME Poll Winners concert footage from 1964 and 1965, a new interview with director Brett Morgen, “The Sound and Music of Crossfire Hurricane”, footage from The Arthur Haynes Show (1964), and the theatrical trailer. "Crossfire Hurricane" received its worldwide premiere at the London Film Festival in October; the film received a similar premiere in the U.S. the following month, hosted by HBO at the Ziegfeld Theatre.